If you know me and I mean REALLY know me, not on some ole through this blog or Marriage Exposed but have really sat down and chopped it up with me, then you know I can be shallow at times. Well, to be honest, I'm VERY shallow. In fact my wife calls me Shallow Hal, you know like the movie? So the way you look can determine if I'm gonna check for your music...at all. It might not be right but hey, that's how it is. And I can't front, when I first saw Miguel, I thought to myself, "who is the Ritchie Valens, Arthur Fonzereli dude with a conk? There's no way I'm checking for dude's music." That is...until I heard "Adorn." I was upstairs in the studio working on some music and heard it playing downstairs and I was like "what the hell is that?" (I always leave my TV downstairs on VH1 soul even if I'm not downstairs watching TV) So I come down and rewind it to find out who's song this was and ya'll already know my jaw hit the ground when I found out it was Miguel! The Ritchie Valens dude made this?!?!? Word?!?!? Aiight, so now I gotta check dude out. So after chillin' with his "Art Dealer Chic" EP's for a minute I was officially checking for dude but the question was how's money gonna come on his full length? So now that his sophomore album "Kaleidoscope Dream" is on tap, another question becomes is Miguel on his Kentucky one and done jawn or is this dude here for the long haul? "Kaleidoscope Dream" sets off with "Adorn" which isn't even fair to the rest of the album cause it took me a good 30 minutes to stop playing it to get into the rest of the album. But you can't get mad at dude for putting his best foot forward out the gate. "Don't Look Back" has a dope Sneaker's Pimp feel to it while Miguel sings "I feel the night approaching, the moon is calling me, reluctant eyes have witnessed,the horrors I can be, I felt compelled to warn you, I’m not all that I seem, and though I care about you, the night is calling me." The Pop and Oak produced "Use Me" checks in with an ill slow and sensual feel to it and the Jerry Wonda produced "Do You" is simply ridiculous. The Salaam Remi produced "Kaleidoscope Dream" samples Labi Siffre "I Got The" made famous by Eminem and "How Many Drinks" asks the simple but old age question, how many drinks is it gonna take to get in your pants? "The Thrill" and "Arch and Pint" both have a rock vibe to 'em and "P-ssy Is Mine" is kinda self explanatory. The album ends on a high note with the thought provoking "Candles In the Sun" which has Miguel asking "Is there a god? Is he watching? Is she watching? Are they watching now? If not what are we doing? Where are going? What are we doing now? Look at all these people, searching for a reason, searching for a peace of mind, they say we're all created equal, at least that's what they teach us, but that ain't how we treat each other." But my favorite track on the album is easily the Pop and Oak (who are quickly becoming two dudes I'm checking for) produced "Where's The Fun In Forever?" First things first, the drums are enough to hold down this track dolo but then you add the bassline, the keys AND Miguel?!?!? Money's stupid for this one. 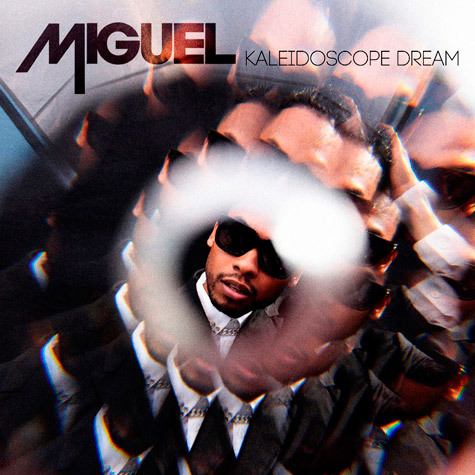 So no matter how you look at it, "Kaleidoscope Dream" is a REAL dope album and is enough to make any Miguel non believer renege on not checking for dude in the first place. But one thing that I can say that I've learned from Miguel and "Kaleidoscope Dream" is to stop judging books by their cover. Cause if you do, not only could you miss out on an incredible book...but you may miss out on an incredible album. And the illest thing to me about Miguel is that he'll definitely help keep my homegirl Sam over at RCA hands full because between him and Elle Varner, they've got the future of R&B on lock. And by the way, Miguel is FAR from being one and done, dude is mos def here for the long haul...just in case ya'll were wondering.